Both of July's winners are first time recipients of the SoxProspects.com Player of the Month award. Since catcher Dan Butler and right-hander Luis Diaz (pictured) are also both currently ranked outside the top 40 on the SoxProspects.com rankings they might be considered surprise winners, but that is no slight on their abilities nor does it diminish their impressive performance over the past month, but rather it speaks to the overall strength of the system. 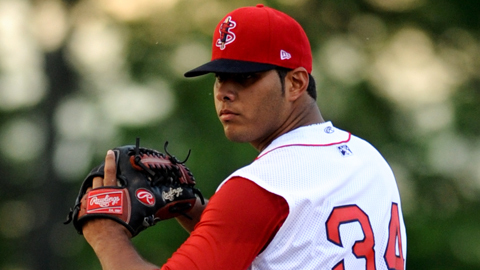 Diaz has won a SoxProspects.com award before, taking home Pitcher of the Week at the end of June. He continued to build on his strong end to June and carried it right into July. Pitching at Greenville for the second year after a mid-season promotion last year, Diaz has dominated all year posting a 2.44 ERA over 70 innings with 67 strikeouts to only 16 walks. If that was not good enough, the 21 year-old took it to another level in July with 29 strikeouts, only four walks, and a sparkling 1.20 ERA over 30 innings while going at least five innings in each start. The Venezuelan's three pitch mix - featuring a fastball at 90-94, solid slider, and developing changeup - is starting to round into form, and continued performance like this could merit a promotion before too long. However, he did struggle in just under 100 innings at the level last year, and therefore the Red Sox may wait to make sure the consistency is there before challenging him at the next level. In 2011 Butler (pictured) won three Player of the Week awards but was never able to take home a Player of the Month award. That finally changed with a dominant July for the Pawtuckett Red Sox. 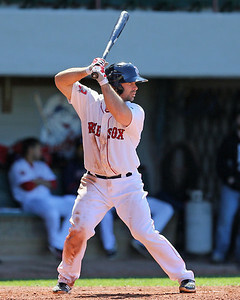 His five home runs on the month were more than half of his total from the entire 2012 season. Just like Diaz, his overall slash line on the year of .275/.374/.491 is very good, but he took it to another level in July with a .362/.464/.690 line with more walks than strikeouts. Butler is known more for his defense and his lower ceiling contributes to his ranking, but continued strong performance like this could force the Red Sox to see if he can reach his ceiling of a major league backup. Photo Credit: Luis Diaz by John Corneau/Lowell Spinners and Dan Butler by Kelly O' Connor.